I had decided that despite this being my first visit to the Ekushey Boi Mela, I would not bring patriotism into my review. Not because I shy in harbouring such emotions; not by any standards, but because of unbendable word limits that obliged me to realise this article would have to be left neat, trim and concise. Sadly, however much I had intended to follow restrictions pertaining to length (just once), one look at the queues is all it took to dismantle well-intended principles. And that is exactly where my (un)styled head full of debutante expectations first turned into awe: sight of the impossibly long and literally coiling queues. I beg to reach a compromise. Although I will refrain from overdoing the issue, the topic deserves at least two lines of mention, if for nothing else then at least in appreciation of the immense time and trouble so (read many sos for added emphasis) many citizens are willing to take to simply get inside and celebrate our language. For all the skepticism about long-lost patriotism, if people can commemorate our language movement by taking time out of the frenzied routines Dhaka offers as an excuse for life, remnants of respect still remain. And ‘52 has not been forgotten. That being said, let us safely cruise into the fair itself. My own physical entry was a matter of less ease more craftiness, but that is an incident I choose to reserve for clichéd 'memorable experience' essays. Having entered the mela (by fair or unfair means), as can be expected, my primary source of breath-taking was once again the crowds. The sheer number of people inside gave rise to an immediate sense of feeling overwhelmed but aside all else, fullness makes for an intangible rhythm in the atmosphere. Scarce liberty to saunter in any chosen direction and having to submit to 'the flow' has its own element of twisted amusement (of course foregoing the occurrence of practices too indecent to mention in this medium). And besides, what significant festivity is it that lacks in people? I would at least have very little to say about any fair or carnival that did not boast the capacity to draw in the masses. 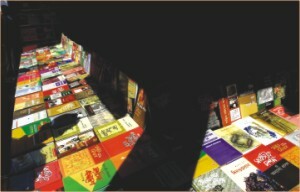 The first stall that I could push my way into provided ample variety in terms of genre of books. Catering to the evergreen theme of love, Rare Books has two separate compilations titled 'Bhalobashar Golpo' by Rabindranath Tagore and Sharat Chandra. For the slightly (or fanatically) religiously inclined the choices are even more on offer. From books specifically bearing instructions about Eid and Qurbani to a list of 'Sreshto 100 Munshi' to specialising in descriptions about the 'Dajjal', the fair offers books for all sorts of conceivable insight into religion. Lingering on the issue of listings, another book that caught my attention was 'Shorbokaler Shorbosreshto Bangali' by Shumonto Rai, the issue of such hype only two or three odd years ago. Aside religion and rankings, other categories such as hair and beauty and health, cooking and recipes have been (more than) well facilitated. As concerns different sects of readers, two divisions that seem to be recurringly remembered are children and students. With colourfully illustrated copies of 'Thakumar Jhuli and Bangla versions of Tom and Jerry and King Kong, the lost art of promoting non school curriculum reads in children seems to be back in full force. And speaking of curriculums, as much as we would like that to be low on the agenda, books covering almost all subjects such as 'Babosthhapona Orthoniti', 'Bijgonit' and 'Bigyaan' are on display throughout the fair. Translations of English books are also to be found aplenty including a wide collection of autobiographies, for example by Hilary Clinton as well as books celebrating the Gods of literature for instance 'Shakespeare Sonnetmala' by Nikhil Kumar Nandi. In conversation with Sahfiqul Islam of the Mukto Dhara book stall, he mentions that the most successful stall this year is Onno Prokash and the best selling authors are Humayun Ahmed, Zafar Iqbal and Emdadul Huq Milon. 'Our own publishing house does not offer books from these authors but our sales are high in terms of children's books. ', he adds. With regard to layout, the only two stalls that stand out from the rest and I feel deserve special mention are the Zia Shangskritik Jot Jisaj and the Awami League Gosthhi. No, not because of praise-worthy décor or exclusive collections, but simply because this is probably the only example of two wings of the parties functioning harmoniously side by side! Apart from the myriad of stalls, there is a Red Crescent 'Roktokendro' (blood donation center) and a canteen that is the hub of much activity. The highlight of my escapade (for that is what my audacity to venture to the book fair on a Friday evening was) was sadly not the books or the crowds or the fervour. Very close to the time of my departure, an announcement was blared on the mic that a lost three year old was waiting at the information desk and was crying too hysterically to give any personal details (as if that can be expected even under other temperaments). As frightening as this might have been, the crux of this paragraph lies in that the very next announcement begged scores of people to stop thronging to the information booth just to catch a glimpse of the lost child. Ah well, if for nothing else, let us hold hands and stand proud of our nationally mutual, innate quest to make a scene out of any given circumstance. In closing thought, despite all the negatives, with its 255 stalls and 541 new books already released, boi mela continues to grow every year-in size and in spirit. We may be short on a lot of ends, but for its mother tongue, Bangladesh is prepared to root, sing, shout, protest, die and if necessary, stand in monstrous queues, get pushed by worthless men and fight the lines through to reach just one counter for just one book-even five decades later.